There's a small army of folks out doing God's work, and you know who they are. You've contributed to the missionary fund. You've prayed for your pastor. You've read the inspiring stories, and cheered the celebrities who speak out for Christ. Christian ministry is a special field—and some things are best left to the professionals, right? Wherever you are, whatever you do, you are a vital part of God's plan to build His kingdom on earth. Your life is designed by God for impacting others. You have the power to touch souls right in your own life—just the way Jesus did—using your daily circumstances as a springboard. And if you've avoided getting involved in the work of God's kingdom because you think you don't have anything significant to contribute, think again. Author Dwight Robertson says it could be as simple as sharing a meal, or treating people with kindness and respect-and he has encouraging, inspiring stories that illustrate the profound effect just one person can have. Through our homes, our vocations, and our hobbies, God's people are spread out everywhere! So imagine what would happen if inactive Christians everywhere started reporting every day for duty. Yes, God has a plan for reaching the world. It's really very simple. It's you. 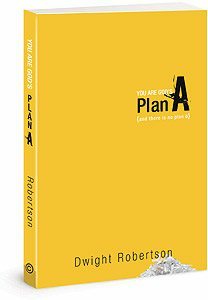 You are God's Plan A . . . and there is no Plan B.